The Chicago Dental Society’s (CDS) annual Midwinter Meeting is an event we would never miss. This year marked the 152nd meeting, making it a valuable tradition not only for Richmond Dental and Medical, but also for other product providers and dental professionals, too. While we always enjoy our time in Chicago, one particular event stood out to us: the Dental Trade Alliance’s 2017 Future Trends Forum. While a ton of data was offered via their dental trends report, the idea of the shifting dynamics around women in dentistry stood out to us as an important topic. Does the Future Hold More Female Dentists? Based on the numbers tossed around at the forum, we certainly think the answer to the question the headline poses is “Yes.” While women currently make up 35% of active dentists, their numbers have risen steadily; in 2004 there were 180,000 practicing dentists, while today there are 194,000 actively practicing dentists. This number should continue to rise. Right now, there are more women than men enrolled as dental students, so simply based on that fact alone the number of female dentists will rise accordingly—and that 35% will climb higher as well. In fact, according to a study completed by the University of Colorado School of Dental Medicine, more females than males are graduating from dental school, with females accounting for 60% of the graduates. Based on those numbers, we’ll see a major shift—probably even higher than 35%—in the number of active female dentists very soon. Women Have the Numbers, But Do They Have Equality? Just based on the anecdotes shared in this American Dental Association article, it’s fair to say that women have faced bias in the workplace even as their numbers have increased. While the number of female dentists is climbing, that doesn’t mean women are represented equally in leadership and education positions, or that the wage gap has narrowed as much as it should. When it comes to the wage gap issue, dentists aren’t alone; this recent study by the Journal of the American Dental Association (JADA) shows discrepancies for women physicians and lawyers, too. The gender diversity issue applies to dental school faculty as well. 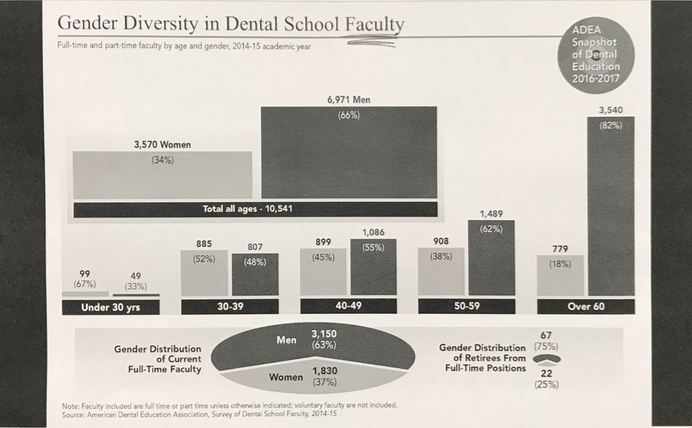 According to the graphs below—based on a 2014-15 survey conducted by the American Dental Education Association (ADEA)—the lack of equality also exists among full-time and part-time faculty, coming in at 66% male and 34% female across all age ranges. Is a Tipping Point on the Horizon? What we choose to take away from the women in dentistry trend is the fact that we’re coming, quickly, to a tipping point. With so many women enrolled as dental students, looking even farther ahead—past 2020—it’s quite possible that there will be as many women in the profession as men, and possibly even more. We can only assume that as more baby boomer/male dentists retire over the next few years, women will be the ones to fill that void. Hopefully with more women in the dental profession, the wage gap will slowly shrink. Women have come along way in just 40 years. Simply based on their progress during that time span, and their increasing numbers in the dental workforce, it’s hard to think they won’t overcome some of the challenges they face. We certainly won’t be counting them out.